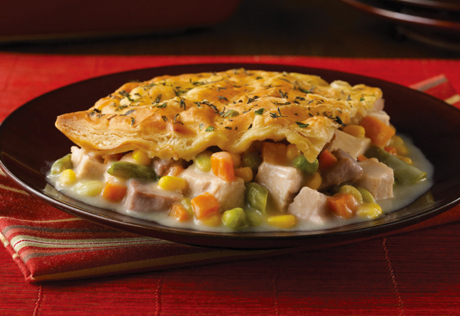 Stir the turkey and vegetables in a 3-quart (13 x 9-inch) shallow baking dish. Heat the butter in a 2-quart saucepan over medium heat. Add the flour and cook and stir for 3 minutes. Gradually stir the broth into the saucepan. Cook and stir for 5 minutes or until the mixture boils and thickens. Stir in the black pepper. Pour the broth mixture over the turkey mixture. Unfold the pastry sheet on a lightly floured surface. Roll the pastry sheet into a 13 x 9-inch rectangle. Place the pastry over the filling. Press the pastry to the rim to seal. Brush the pastry with the egg mixture and sprinkle with the herbs. Cut several slits in the pastry. Bake for 25 minutes or until the pastry is golden brown and the filling is hot and bubbling. Let cool on a wire rack for 20 minutes. Alternate Preparation: For a more striking presentation, you can flute the edges of the pastry as you press it to the rim. Ingredient Note: We like to keep a 32-ounce package of frozen mixed vegetables on hand. Use 5 cups for this recipe, then save the remainder to easily stir vegetables into soups, stews or casseroles.